Hang on a minute. This wasn’t supposed to happen. People told us that we would have Manuel Antonio Beach (Playa Manuel Antonio) to ourselves at this time (it was 07:30), but here we are surrounded by locals. 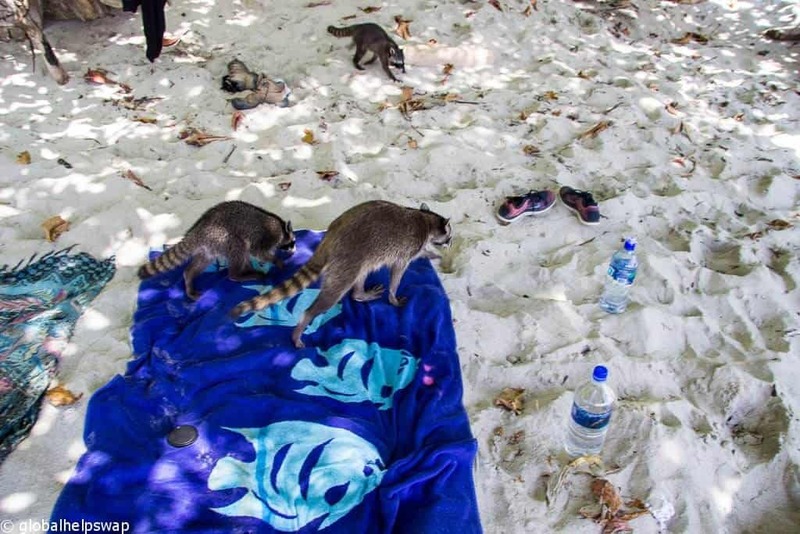 One has plonked himself on my towel and two have even tried to steal our lunch. Another group are making so much noise it is changing the vibe of this serene beach. This isn’t like Costa Rica at all. All the locals we have met have been polite and considerate. Not this lot. 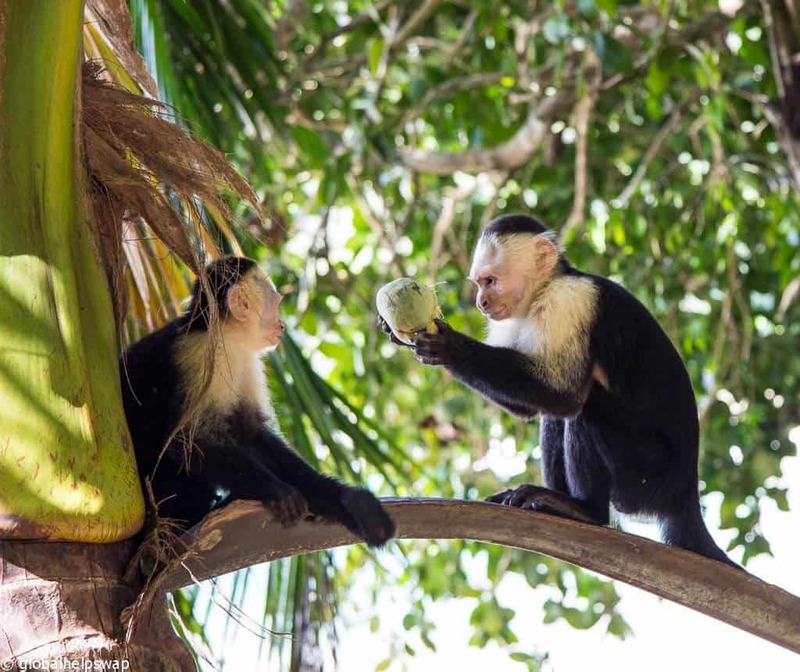 Welcome to Manuel Antonio National Park a place where the wildlife show you whose park it actually is. That’s right, the “locals” were all different animals. We have never been on a beach with so much wildlife. 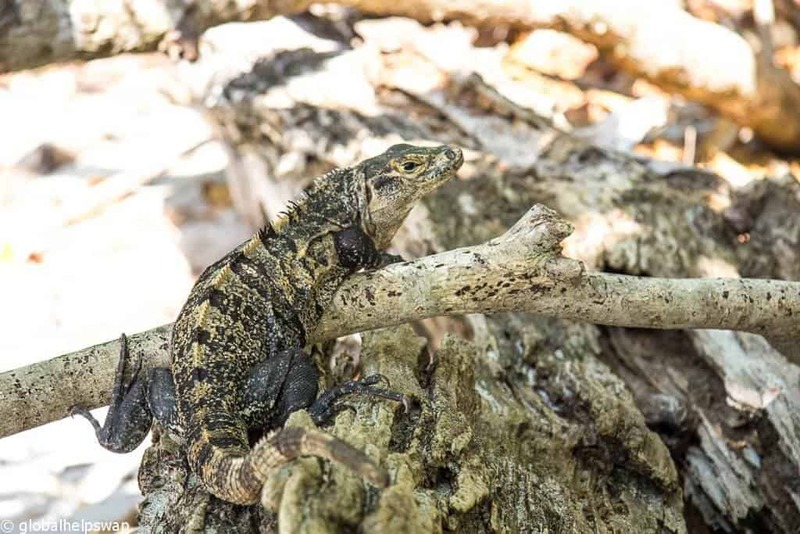 As soon as we found a spot under a tree for shade, a monitor lizard!? clambered down from its spot and sat on my towel. I had to budge up to give it room it was so relaxed. It lay there soaking up the sun for 30 mins before heading back to its tree. The first local that decided my towel looked very comfy! We then headed into the mighty Pacific for the first swim of the day. It was wonderful as there were hardly any people on the beach (that would soon change) and we had Parque Nacional Manuel Antonio as our backdrop. As we swam in the ocean, I noticed 3 small shapes scurrying around on the beach. 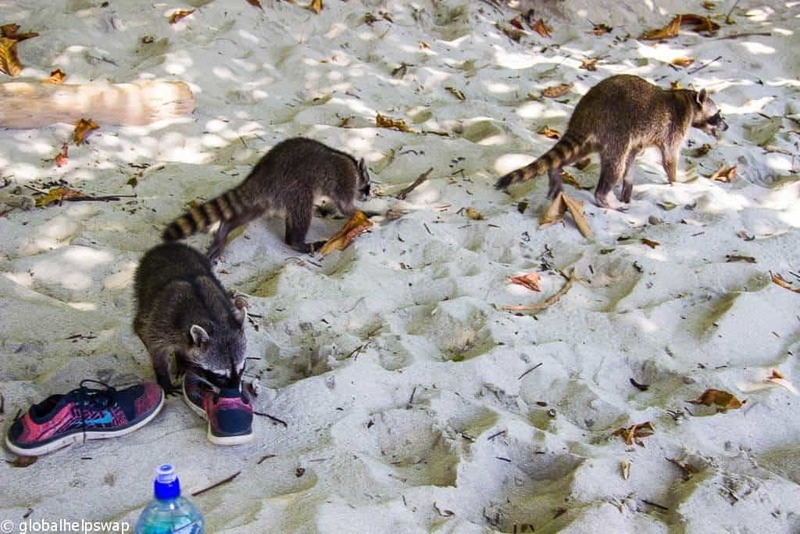 We realised they were Racoons and they were heading towards our towels. One raccoon got to my backpack and was actually unzipping it to get to our sandwiches! I quickly ran up to her and literally had a tug-o-war with a raccoon to get my bag back. Only in Costa Rica! 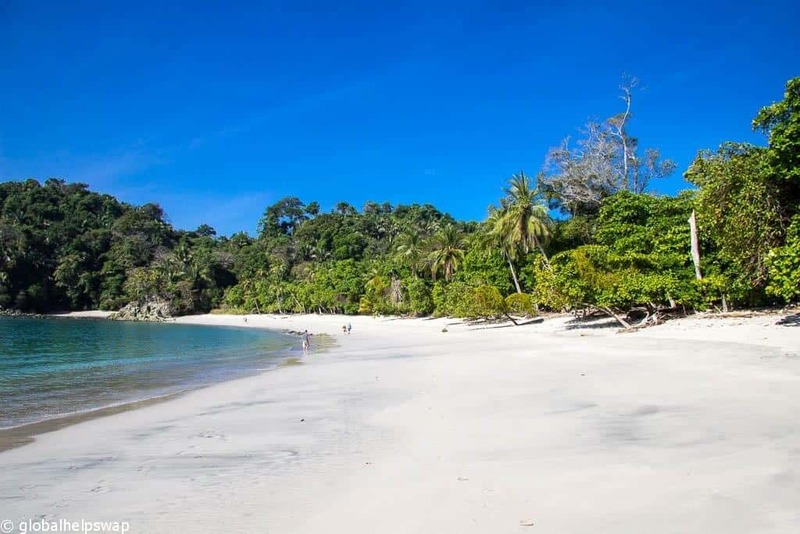 Manuel Antonio Park is the smallest National Park in Costa Rica. Located 132 km (82 miles) from San Jose the capital, the park receives up to 150,000 visitors annually. It was created as a National Park in 1972 and in 2011, Forbes rated it as one of the most beautiful National Parks in the world. What it lacks in size this park makes up with the amazing diversity of life in its 3 square miles. Incredibly there are 109 species of Mammals and 184 species of birds in those 3 square miles. When you consider that there are 101 mammals in the whole of the UK you will appreciate how rich Costa Rica is with wildlife. 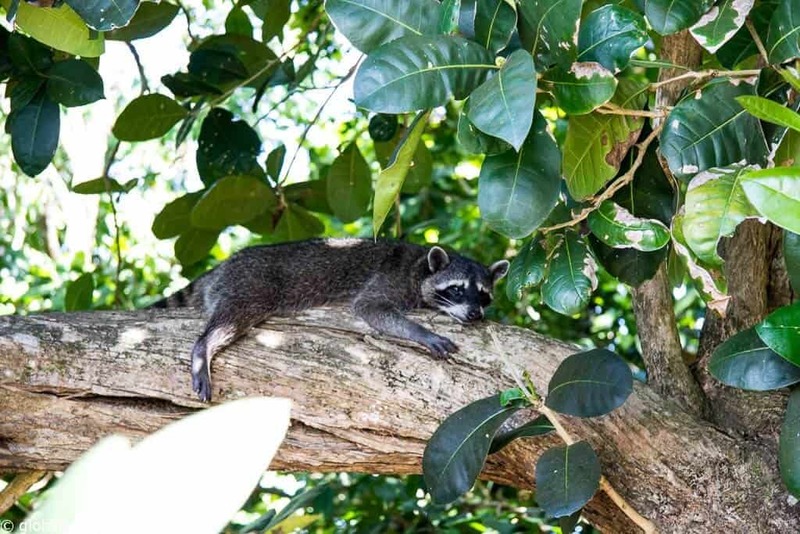 Other animals that entertained us on Playa Manuel Antonio were the Central American Squirrel Monkey and the Coati. The monkeys were the ones making all the racket. They too were up to mischief. Visitors are warned to keep their valuables close at hand as the monkeys will steal them. I saw a few monkeys with sunglasses in their hands. The Coati on the other hand just wandered about looking cute. 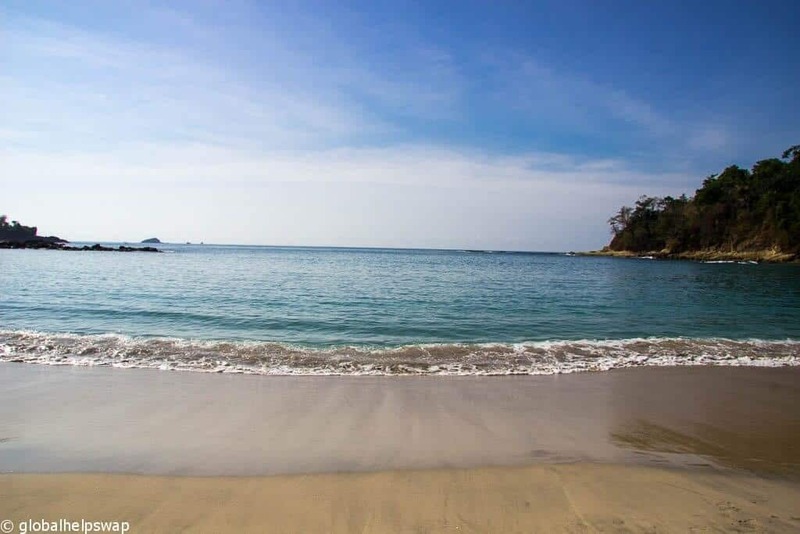 Besides Manuel Antonio Beach there are another 3 other beaches in the park: Espadilla Sur, Teloro and Playita. 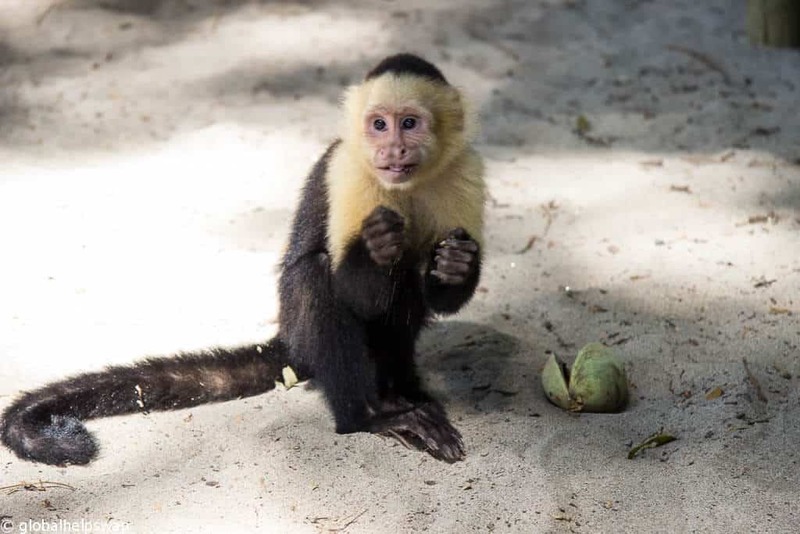 As we were so happy being entertained by the wildlife on Manuel Antonio beach we never made it to the other beaches. 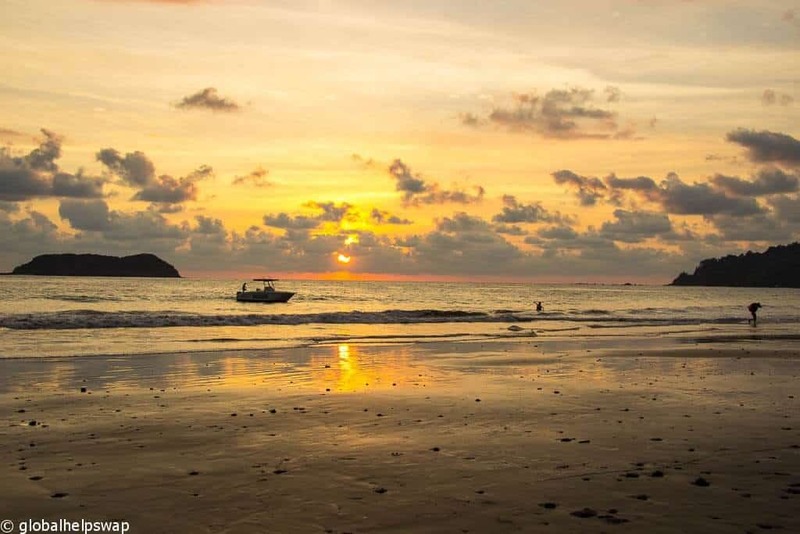 They are a longer walk than Manuel Antonio beach and so they will probably be quieter too. Manuel Antonio did get busy after 11.30 which made us very glad we got there early enough to have the beach for ourselves for an hour. If you do decide to visit, make sure you bring your own food and drink as there are no food vendors inside the park. However the park does have toilets and showers which come in handy if you decide to go explore the trails after a swim on the beach. 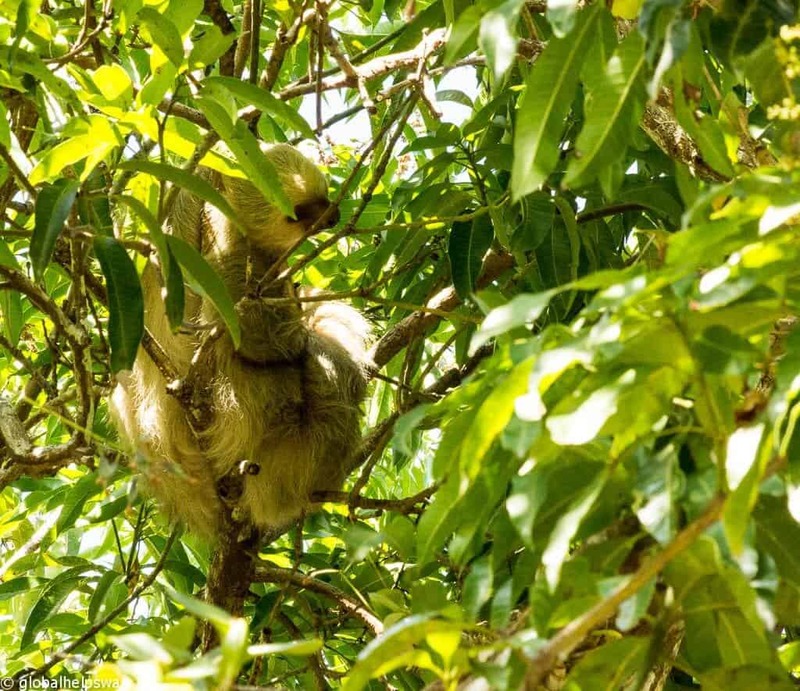 On our walk around the park we very happy to have spotted Sloth and Toucans, two animals that are ubiquitous all around the country. There were also tons of stunning tropical birds. 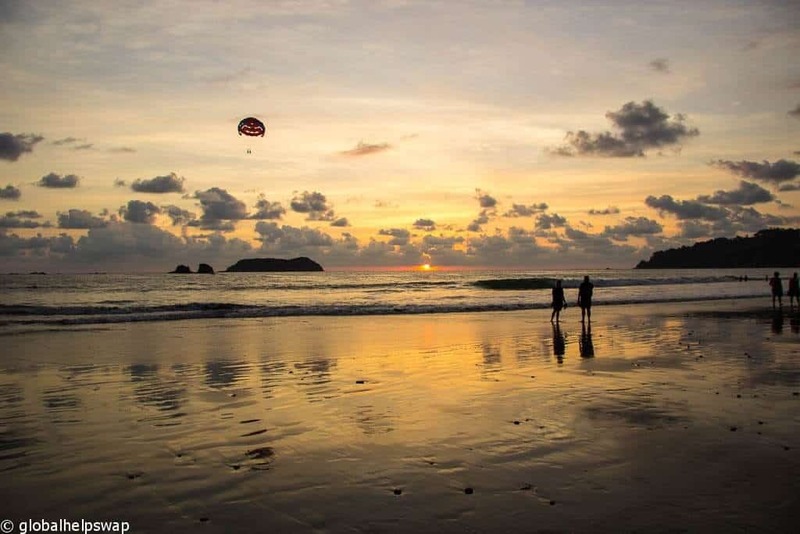 Manuel Antonio National Park is the second most visited in Costa Rica after Poás Volcano National Park which is very close to San Jose. So don’t expect to be alone as you observe the wildlife. If you are looking for more solitude then we recommend visiting Monteverde Cloud Forest as the area is larger or better still go south to Parque Nacional Corcovado. 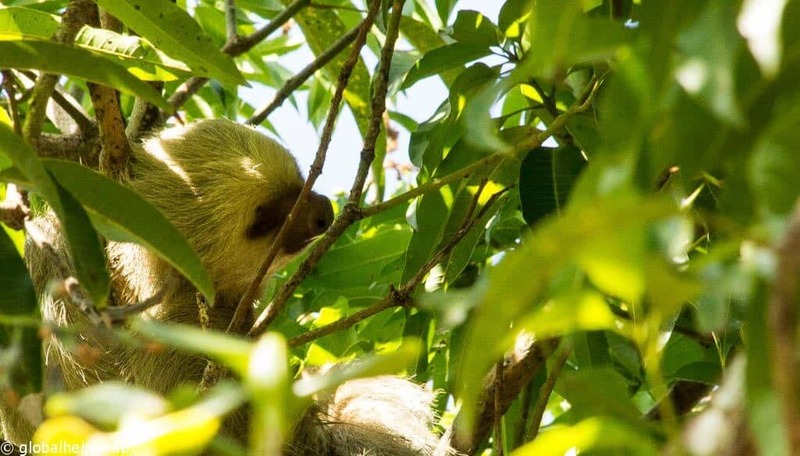 However that is not to dismiss Manuel Antonio National Park. We had a wonderful day there. 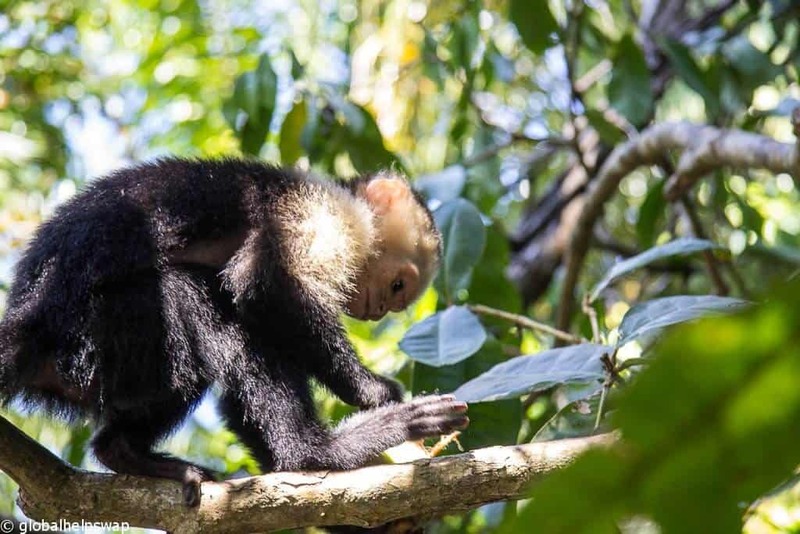 If you are short on time and want to observe some of the fabled Costa Rican wildlife and enjoy a swim in the ocean, then Parque Nacional Manuel Antonio is the national park for you. Just outside the park is Playa Espadilla, a beautiful beach to watch sunset. We stopped off for some Ceviche and beers. Thankfully there were no Raccoons to try to steal them this time, but there was a sloth hanging out on the tree just in front of the bar! A Raccoon putting his nose in Karen’s trainer. Brave Raccoon! Adults – $16. Children under 12 – Free. Tickets may be purchased at the park entrance at Coopealianza by cash or Visa. Guided tours are available at $51 for adults and $35 for children. Private tours are available at $71 for adults and $55 for children. All guided tours include round trip transportation from MA / Quepos hotels and vacation homes, entrance fee, bilingual certified guides with high-tech telescopes, 2.5-3 hours of guided tour including time to spend at the beaches and tropical fruit. You can choose to spend the rest of the day inside the park but might need to take the bus or a taxi back to your hotel. Tuesday – Sunday – 07:00 – 16:00. Monday Closed. Food restrictions: Soft Drinks and waters are permitted, no alcoholic drinks are allowed in the park, you may bring packed sandwiches and ready cut fruit. This is in order to keep the impact on the environment as low as possible. Beaut place to see & photograph, including the native fauna & flora. We had only limited time on the tour, but one of those spots that you could go back to. For sure! Thanks for the comment. I visited Costa Rica few years back and fell in love with the country. Atenas, La Paz Waterfall Gardens Nature Park with 5 amazing waterfalls and more, Jaco, Manuel Antonio National Park you just discribed to perfection, Poás Volcano National Park and Uvita which is the closest village to Marino Ballena National Park in OSA Penninsula.. All fabulous places so worth a visit or two. Thanks for the info and comment. We are glad you liked the post. Happy and safe travels!